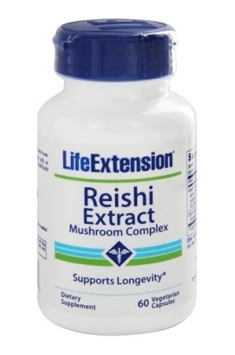 Life Extension Reishi Extract is a dietary supplement in the composition of which there is the highest-quality extract from Reishi mushrooms, standardized for the content of polysaccharides and triterpenes. The preparation demonstrates strong immunomodulating and anti-inflammatory properties. It is recommended as general health prophylaxis, to support immunity and increase the level of vitality. Reishi mushrooms have a large anticancer potential, which has been documented with many clinical research. Although they are not a remedy to cancer diseases, they are worth applying preventively and as a support of standard therapies among already sick people. It is often said about Reishi mushrooms that they promote longevity. In fact, they may improve both the quality as well as the length of life. By modulation and stimulation of the immune system, they make the organism resistant to harmful effects of external factors and minimize the risk of the development of civilization diseases, called the largest World killers (cancers, circulatory system diseases). Reishi (Ganoderma lucidum), also called lingzhi mushroom is a species of very popular mushrooms with such a strong pro-health potential, that Chinese medicine recognized as a therapeutic product. Rich phytochemical composition and numerous, unique, pharmacologically active compounds enable wide application of extracts both in therapy as well as in the prevention of many diseases. The most important compounds, which represent the miraculous properties of Reishi mushrooms are triterpenes (especially ganoderic, ganolucidic and lucidenic acids) and polysaccharides (especially glucans). Moreover, in the composition of Reishi mushrooms we may also find sterols, proteins, phenols and many valuable minerals (copper, zinc, iodine, selenium, iron) and amino acids. Immunomodulating activity of Reishi mainly relates to the activation of immune cells, such as: lymphocytes, macrophages, dendritic cells and NK cells (natural killers). Mitogen properties of Reishi mushrooms are also not without the meaning – by inducing mitosis of immune cells, they influence the increase of the population of lymphocytes. The stimulation of the immune cells by Reishi contributes also to the intensification of cytokines production. The release of cytokines is one of the functions fulfilled by activated NK cells and macrophages. Cytokines maintain higher organism functions, control cell divisions, their proliferation and apoptosis. Some of them (INF-g, TNF-a) may naturally modulate specific immunological responses. In the world of science a lot has been said about a new bioactive immunomodulating protein isolated from mushrooms, among others from the species Ganoderma lucidum, the so-called FIP (fungal immunomodulatory protein). The activity of FIP helps to produce new pathways of defense reactions in the organism. Therapeutic activity of Reishi mushrooms in relation to cancer diseases is the effect of the activity of triterpenoids, polysaccharides and FIP protein. It involves three main mechanisms: immunomodulation of effector cells directed to cancers, promotion of cytokines production as well as activity and inhibition of angiogenesis in the developing tumors. Reishi mushrooms cause the mobilization and growth of the number and the activity of those cells of the immune system, which are most specialized in the fight with cancers in the organism in which pathological tissue growth has already taken place. Angiogenesis inhibition leads to limiting blood supply in cancer cells, as a result of which they get starved and die. In laboratory experiments it has been also proven that Reishi mushrooms increase the endurance of the construction of cancer cell walls making them less susceptible to mutations and spreading. Clinical research proved that Reishi mushroom extracts have synergistic, therapeutic effect with radiation and chemotherapy. They also lower the number and intensification of undesired side-effects of traditional cancer treatment. Reishi mushrooms improve metabolic parameters, which allows to use them in the treatment and prevention of such problems as diabetes or cardiovascular system diseases. Reishi mushrooms help to regulate lipid profile – they lower the level of unbeneficial cholesterol fraction LDL and triglycerides and increase the level of „good” cholesterol HDL. Thanks to this, the minimize the risk of atherosclerosis. Adenosine contained in Reishi has anti-aggregative effect. It prevents clumping of blood platelets and creating clots dangerous to health. By the same token, the main cause of strokes is eliminated. Reishi mushrooms have anti-diabetes properties. Ganoderma B, extracted from them, demonstrates the highest activity. It levels up the proper values of both glucose level as well as insulin. Antioxidant properties of Reishi are also not without a meaning. Polysaccharides contained in the mushrooms protect pancreas islets against oxidative stress and damages caused by free radicals, promoting proper insulin secretion. Reishi mushrooms prevent hypertension. The research carried out on people with increased blood pressure showed that after six months of supplementation, systolic blood pressure was reduced, amounting to proper values. Importantly – the control group with proper blood pressure did not notice any considerable changes in the tested parameters. Summing up, Reishi Extract is a preparation with a wide range of applications. It constitutes a valuable support for the organism in the periods of exhaustion, weakness or infection. When used preventively, it helps to avoid more and more common civilization diseases and cancers. The extract contained in the preparation is of natural origin, is not toxic and is safe for the organism. Its effectiveness has been documented in many clinical studies.